This is not the version of Chrono Trigger you’d likely want to play. That’s because contrary to the pictures (and common expectations), this isn’t a port straight from the SNES, or a version based on the DS re-release we saw a few years back. Instead, it’s a redo of the mobile version of the game. What’s more, it’s not exactly a thorough redo of the mobile version either, with the same UI choices being carried over despite the differences in platform, and changes that make no sense given the game’s situation. And that’s not the end of it either. Oh no, there are tiling issues, weird filters applied to the game, very few options to customise the experience and no way to edit the controls to make it more convenient for the player. Indeed, this one is in fact so limited (and clearly edited from the mobile version) that even the tap overlay remains intact here. You know, the thing that only makes on a touch screen device. So, while it’s still a good game (and that this version is at least a legitimate version of it), it’s not the one we’d recommend you buy. Try the DS version if you can find it, or the one on the Wii Virtual Console if you still have access to that thing. Those are much better ports, with either some decent new features or the original UI from the original version instead. Still, what do you think about it? 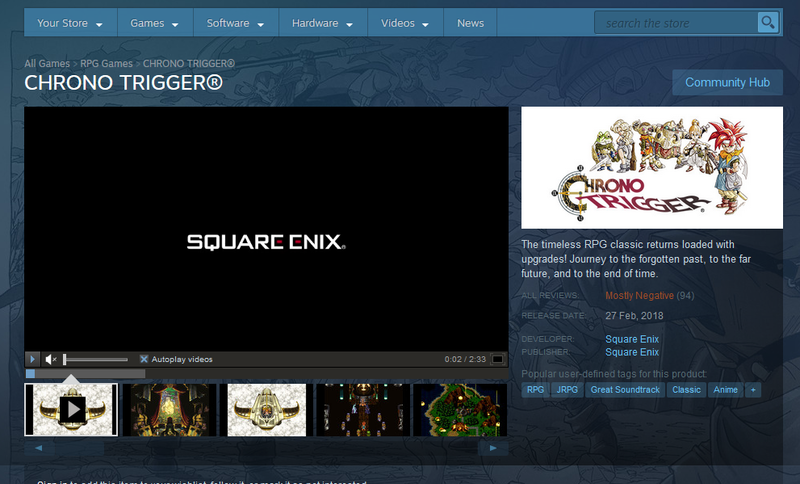 Are you happy with this version of Chrono Trigger you can get on Steam? Or do you feel Square Enix may have done a pretty poor job with this port? Tell us what you feel about the game here in the comments or over on Gaming Latest today!